MyPlates.com, the state's vendor for marketing license plates in Texas, will be conducting the Single Digit License Plate Auction beginning on March 25. My Plates will auction two incredibly rare Texas license plate messages, each only a single character! Winners are identified immediately as Lots close at auction end. Winners must contact My Plates within the 3 business days following auction close to select their plate background and confirm customer information. The My Plates Customer Service Center is open to call M-F, 8a-5p at 888-769-7528. Each won plate message includes an initial 5-year term, and then the owner has first right of renewal at everyday pricing once initial term expires. Auction plate messages are also fully transferable, meaning they can be legally passed on to other family members, gifted to a friend, or even sold onward for a profit. Winner picks from 100+ eligible plate designs. Texans wishing to bid must first register by clicking the "Go to Auction" link. While registration is typically quick and simple, please allow yourself enough time to complete in advance of auction close time. The Auction will be conducted online and will run through May 1, 2019. The first lot "3" will close at 8:00 pm and the second lot "W" will close at 8:30 pm. Auction runs until May 1, 2019. 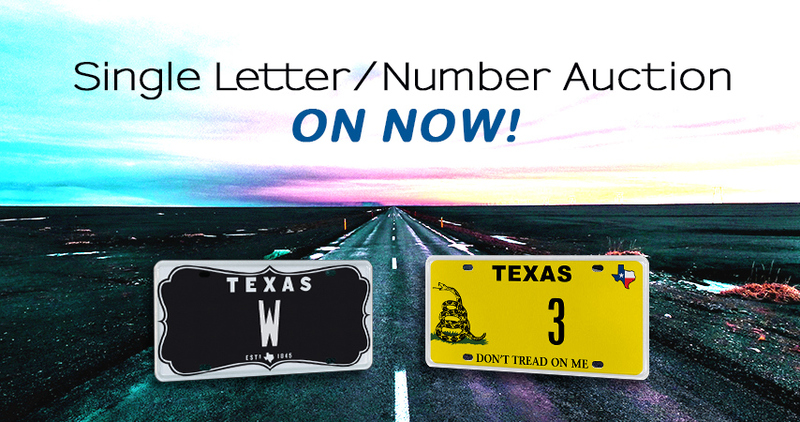 Two incredibly rare Texas license plate messages up for bid! Each a 5-year term, renewable and fully transferable. Pick from 100+ eligible plate background designs. To see the messages on offer, please click the "Go to Auction" link. My Plates’ Auctions offer Texans a unique opportunity to purchase a coveted selection of reserved and sometimes never before released plate messages. My Plates was given authority by the Texas legislature to auction these types of plate messages to help raise money for the Texas General Revenue Fund, which helps pay for services for all Texans. Auction plate messages are highly sought-after and attract a great deal of attention from the media and public alike. To receive updates about all of our auction events, sign up for our periodic newsletter - PL8 NEWS. In addition to providing you with the latest information on My Plates' auctions, PL8 NEWS will give you exclusive offers and keep you informed about new plate designs, plate releases, events, surveys, stories, and more. Opportunity to purchase a truly exclusive plate message from My Plates' reserve collection. First right of renewal at the state's everyday pricing, which means you can keep the plate for as long as you choose to renew it. Auction plates are fully transferable. Not only can they be transferred from one vehicle to another, but also person-to-person, such as parent to their children or friend-to-friend. The plate owner also has the right to sell the plate message to another person with the same ongoing rights. As a result, Auction plates could be an excellent investment. Peace of mind, knowing that you're purchasing your official Texas license plates from My Plates, the authorized specialty plate vendor for the Texas Department of Motor Vehicles. Supports the General Revenue Fund of Texas, which provides services for all Texans. To read the Auction Terms and Conditions, click here. sold for $115,000 in September 2013, making it the most expensive plate message in Texas. sold for $25,000 in January 2013.
sold for $16,500 in January 2013.
sold for $15,000 in January 2011.
sold for $11,500 in January 2011.
sold for $10,500 in February 2018.
sold for $10,250 in March 2016.
sold for $6,250 in November 2016.
sold for $5,250 in August 2017.
sold for $5,250 in May 2016.
sold for $4,900 in November 2016.
sold for $4,300 in November 2015. REGISTER YOUR INTEREST IN SELLING YOUR PLATE AT AUCTION! Do you own a desirable plate message? Is your plate message valuable? Would you be interested in selling your plate via a My Plates auction? If “yes”, then please click the button below.